This weekend I issued a Michigan #Yogachallenge at the Michigan Yoga Fest at Song of the Morning Ranch. It was one that had nothing to do with selfies or 30-day anything. It was a challenge to change. I shared the story of Just B Yoga and our model which is less aligned with yoga business and more with yoga service. We are often told by students and community members that Just B Yoga is different, not just because we are donation-based. Rather than thinking of an exchange of services, can we be more of a symbiotic system with our greater sangha? Yoga is community building, connecting us to our inner selves and to one another. What’s going on in your community? What’s the unemployment, homeless, substance abuse, crime rates? What’s the state of education in the public schools? Are there social movements gaining steam? Is the budget so bad the state is considering an emergency manager? Who are the movers and shakers in your town and do they know who you are? What is your studio’s connection to the local community as residents, parents, teachers, employees? Then what’s your relationship as yogis? 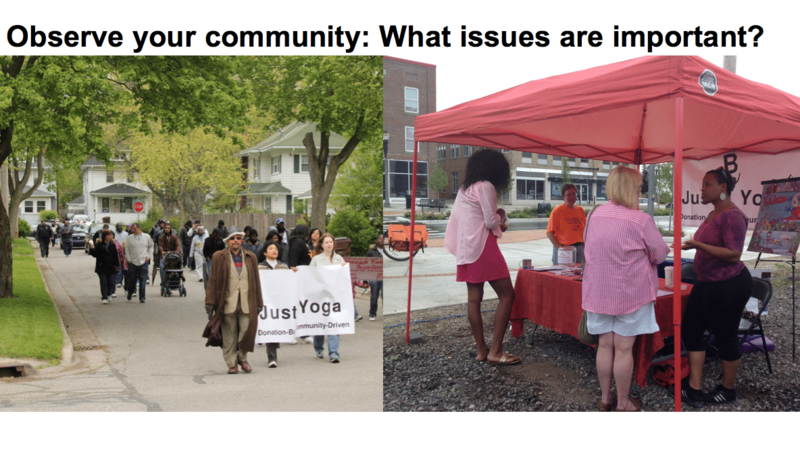 Just B Yoga has participated in community marches against violence in the city, art festivals to raise awareness of the need to invest in our creative side, yoga in schools that have removed physical fitness. We are aligned with a popular social media activist stream called #LoveLansing. 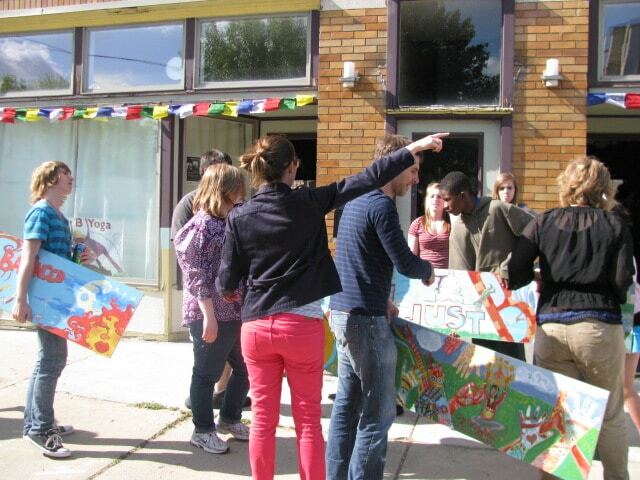 Is your studio helping build a sense of place in your community? Where is your studio located? Is it accessible? How are you making your role and presence felt in a positive way in your city or town beyond asana? How do you help make your town a destination and your studio a destination within your town? Who do you need to learn from, collaborate with, invest in? We are active in our neighborhood to promote it as a positive location to visit in our town. We are participants in the Be A Tourist in Your Town event in Lansing. 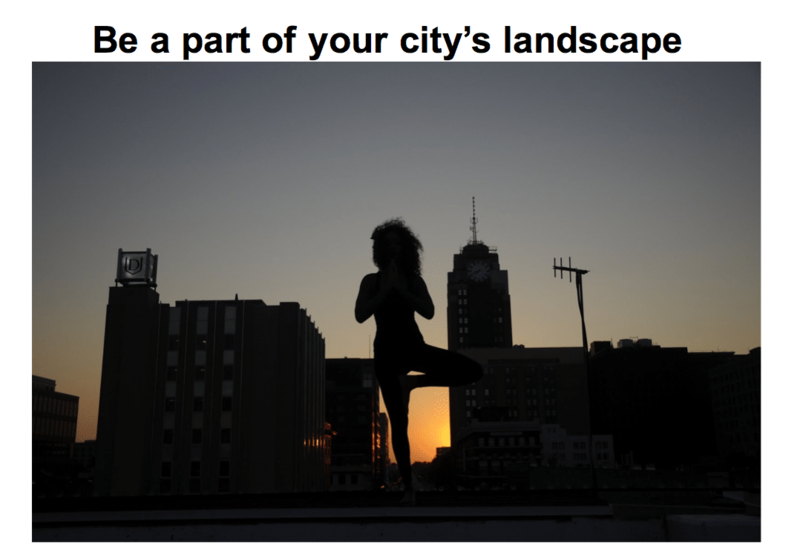 We created an art project photographing our students and teachers doing yoga in lesser-known locations around town. What do your students and community need? What kinds of health issues are they facing? Economic or social issues? How much do you know about your individual students? How can your studio reflect them? Just B Yoga has classes that evolved as a direct result of requests from students, like our LGBTQ Yoga Flow, a class that is allied and friendly. 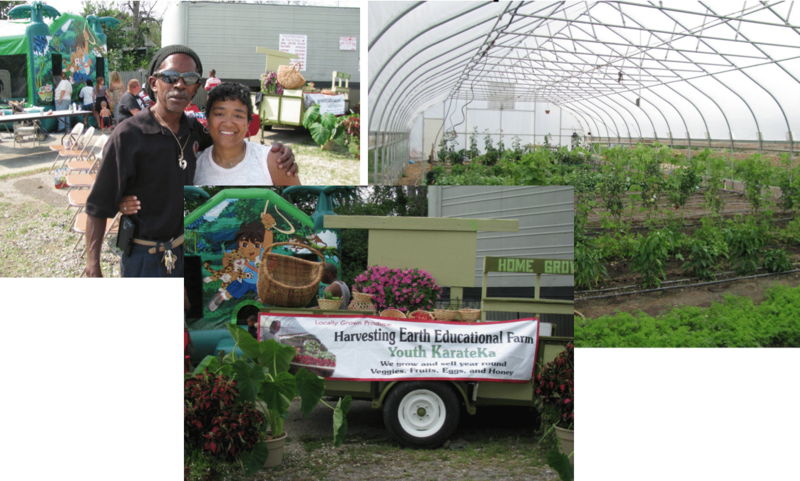 Our community garden has evolved because of our students. We’ve held farmers market days with fresh produce because of our students. Do you only belong to yoga organizations? Join the chamber of commerce, visitors bureau, neighborhood watch, neighborhood association, local nonprofits (sit on the board). Join neighborhood festivals and annual events. Coordinate your own. Partner with yoga and non-yoga organizations you support or admire. Find organizations where you can align your missions. Creative business-to-business partnering opens exposure to potential new yoga students. We helped create the Lansing Yoga Passport, which offered yoga classes in various studios around town. Just B Yoga partners with Annabelle’s Pet Station (a dog daycare) to offer yoga with your dog and a local raw juice company for our detox flow classes. Just B Yoga is a member of the Greater Lansing Convention & Visitor’s Bureau and is active in the local neighborhood association. We have also partnered with a local youth art program, REACH Studio Art, as a commercial art project resulting in them creating murals for the storefront. 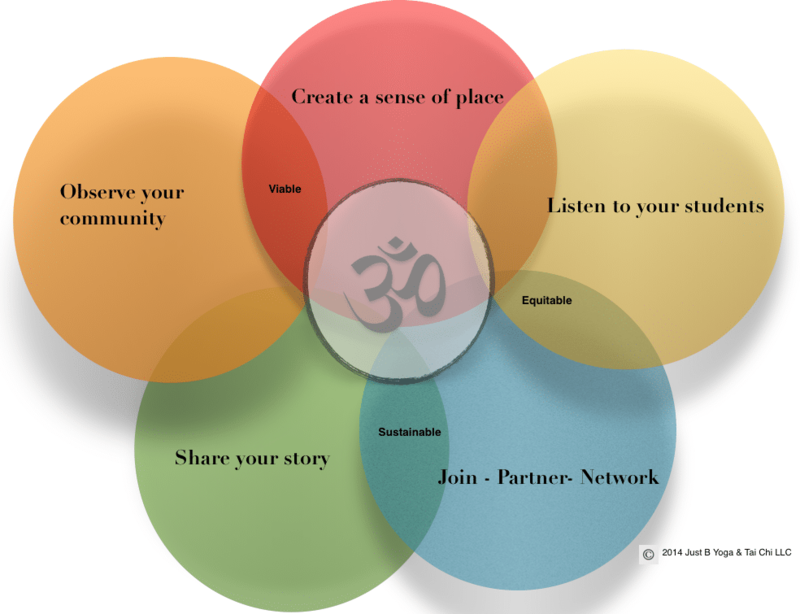 What is your yoga studio’s story? 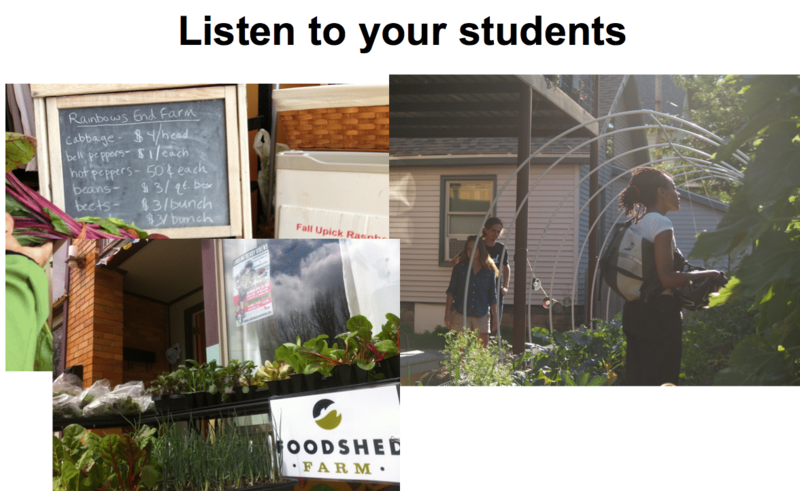 What are your students’ stories – beyond studio practice? What brought them to their yoga? What are their talents? What are their connections to community and why are they at your studio specifically? How can you tell those stories tastefully to create connection with others beyond your studio walls? Humanize the yoga. Let our neighbors see our yoga beyond twisting our bodies. When they see themselves in us, we are one sangha. We share the stories of our teachers with yoga tips. We tell stories of our students in our blog. We tell the stories of others who share the same mission and vision in our community. Just B Yoga visited Youth Karate Ka in Flint. It’s a karate dojo that also created an educational farm. Pictured are Jacky King and Belinda Thurston. 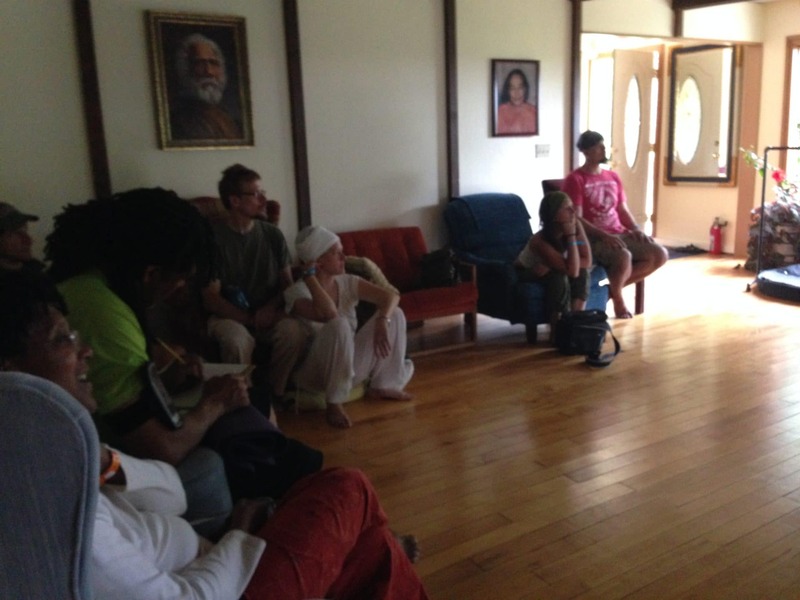 We got to share our story with yogis from around the state. They shared stories of Troy, Flint, Ann Arbor and Detroit. We networked and brainstormed ways we could innovate and integrate with our communities and with each other. We swapped information and took up the challenge happily. 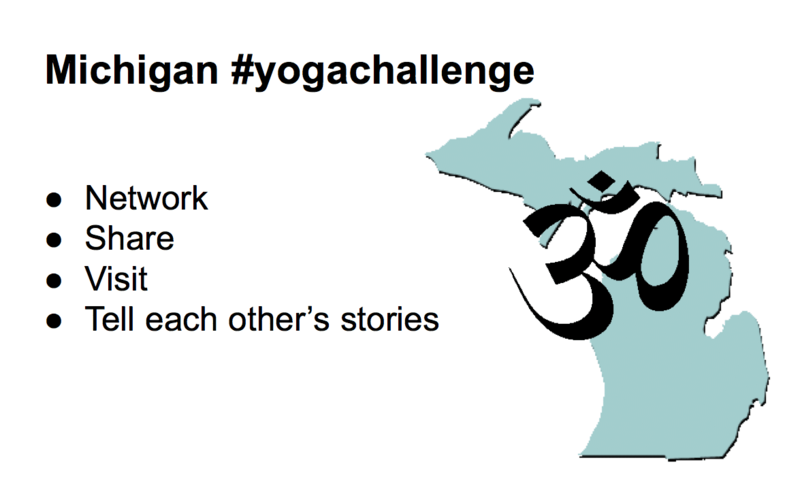 Will you join us in the Michigan #YogaChallenge? Share this blog. Send us your feedback. Share your story with us.